Welcome Office Depot shoppers!. This laptop computer has gone on sale this week (August 12 to August 18) at Office Depot for $450 after two mail-in rebates of $180. Last week it was on sale at Circuit City for the same price. More accessories! Accessory #2 is a USB optical mouse. I did not want to get a tiny tiny mouse, and I did not want to use my regular sized mice, so I picked up something in between, a generic Logitech optical USB mouse. The mouse cable ends with a USB cable, but it also comes with a green USB-to-PS2 converter so you can use it with computers that take PS/2 or do not have USB slots available. Or you can just use the green converter for other purposes. Or sell it on eBay :-) I picked up mine from Office Max ($15 + tax). 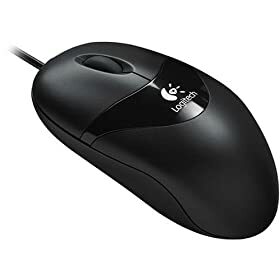 Also available at Amazon for $16 (also 61 customer reviews of this mouse there). If shopping from Amazon, use promotion code LNGXV7VK for a 5% discount (expires 8/13/07). Needless to say using the laptop with a mouse instead of the finger-tablet-thingy device is much faster, at least for me, since I am not particularly used to using the finger-tablet-thingy. But the finger-tablet-thingy remains active when you have a mouse connected, so you can use both. A best of both worlds approach! Fighting for the right-side USB port: Since there is only one USB port on the right, both the mouse (for the right-handed people) and my USB chillpad/fan are closer to the right USB port. Obviously they can't both use it, so one of them has to use the left side. This may add cause some very minor cable clatter, but as long as they are behind the laptop, they don't get in the way... Perhaps when shopping for a notebook chiller/fan, look for one that has USB slots on the left-side (or both sides) - if you do not want cables reaching across behind the notebook :) Not a big deal, but for people with limited space or who like everything organized and neat, it may be helpful!